When it comes to celebrating the birthday of our loved ones, our joy knows no bounds. And today happens to be a very special day for Thala Ajith and music director/producer/actor/singer G V Prakash as it is the birthday of Anushka Ajith, daughter of the former and Saindhavi Prakash, wife of the latter. 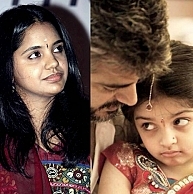 Born in 2008, Anushka is the little princess that Ajith loves to dote. Saindhavi on the other hand married G V Prakash in 2013 and has made a mark for herself in play back singing and also in classical category. Wishing Anushka and Saindhavi a very happy birthday and many more to come! People looking for online information on Anushka Ajith, Saindhavi Praksh will find this news story useful.